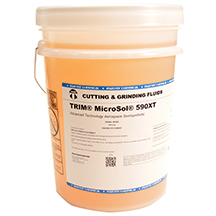 TRIM® MicroSol® 590XT is an environmentally-friendly semisynthetic, microemulsion coolant formulated to pass aerospace approval test requirements. It utilizes the newest technology to provide long life and excellent protection of sensitive alloys. MicroSol 590XT improves on the proven performance of previous generations with a robust stability package using the most environmentally-safe ingredients. The formula is a favorite of environmental advocates, safety professionals, and demanding production managers.